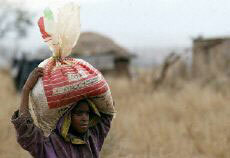 A Swazi child walks home with food aid, Aug. 9, 2002 (Photo: AFP). Millions of people in the world eat genetically modified (GM) foods every day. But recently, seized by fears over possible economic repercussions and potential health risks, famine-ridden nations in southern Africa have chosen to reject offers of GM food aid from the United States. For about the past six months, southern Africa has been in the grip of a devastating famine. A recent report from the World Health Organization (WHO) estimates that nearly 14 million people, including 2.3 million children under the age of 5, are at risk of starvation. Without effective action the WHO says at least 300,000 could die from hunger and disease in the next six months. Aid agencies estimate that the region needs roughly 1.1 million tons of grain to address the crisis. Yet when the U.S. offered 540,000 tons of genetically modified grain to countries in the region, many countries rejected the offer. Responses differed across the region. Swazi officials said that they didn't have an objection to GM food, but Lesotho, Malawi, Mozambique, and Zimbabwe all asked that GM seeds be milled before distribution to prevent their cross-breeding with local flora. Zambia's President Levy Mwanawasa initially blocked GM food aid for the 2.5 million Zambians facing starvation, calling it "poison," but following popular outcry, sent a team of scientists to visit Oslo, Brussels, New York, Washington, and South Africa to study the safety of the GM foods before reaching a final decision. Southern African leaders have concerns beyond the safety of GM foods. Roughly half the region's agricultural exports are sold to the European Union, where there is loud opposition to GM foods, and where they must be labelled as such. African farmers fear that if they are no longer able to certify that their foods are GM-free, they will lose their share in the European market. These European markets are an important source of income for southern Africa's cash-starved economies. From 1999 through 2000, for example, Zambia exported more than 8,400 tons of produce to Europe for US$62.6 million. Between 1993 and 1997, Zimbabwe’s export of peas to the EU grew by 53 percent, so that Zimbabwean imports account for 12 percent of peas and beans consumed on European tables. African agricultural experts also fear that, in order to protect their markets, biotech companies could introduce a “terminator” gene in their seeds, which would prevent small farmers from replanting them after harvest. This would make farmers dependent on big companies that control the price of seeds. In Mozambique, where officials eventually accepted GM food aid, Prime Minister Pascoal Mocumbi told donors that the aid was only acceptable in milled form so that farmers do not mistakenly use GM maize for seeds. "We don't want to create a habit of using genetically modified maize that the country cannot maintain," he told reporters. For countries like Zimbabwe, accepting the U.S. food aid means breaking a four year-long, almost continent-wide ban on GM foods and crops. Back in 1998, at a meeting of the Food and Agriculture Organization of the United Nations, all African nations except South Africa rejected GM crop offers by U.S. biotech corporations like Monsanto, saying "We strongly object that the image of the poor and hungry from our countries is being used by giant multinational corporations to push a technology that is neither safe, environmentally friendly, nor economically beneficial to us." But since nearly 2.5 million of its people are reported to be facing food shortages, some argue that Zambia’s fear of the unknown is not a strong enough reason for the country's government to decline GM food aid. Biotechnology advocates, who claim that GM foods might avert further famine while also protecting the environment by reducing the need for pesticides and herbicides, have been particularly vociferous. They dismiss fears of unanticipated allergic reactions. U.S. Secretary of State Colin Powell reproached African nations for not accepting GM food aid, and weighing in at the Johannesburg summit, reminded African leades that GM foods were good enough for Americans, who have more food than can be eaten.